WE WERE SADDENED to hear of the passing of Lew Portnoy, a Second String Music customer and colorful character. He loved coming into the store with his partner, Lois, and they both loved to play with Fast Eddie. Click here for his obituary. He was from St. Louis and later moved with Lois to Canton, Mo. One of the best things about owning a small business is all the interesting people you get to meet, and Lew was one of the best. He was a pioneer in hockey photography in St. Louis, and I always enjoyed talking about his days shooting photos during the NHL expansion era of the late 1960s. Lew was in the Boston Garden the night Bobby Orr scored his famous flying in the air goal to beat the Blues and win the Stanley Cup. "Well, I was on the other end of the ice," he said. "But I saw it." He regaled me with stories of the old rinks, like the Montreal Forum and Maple Leaf Gardens in Toronto, and of taking photos of legendary hockey figures. His photos are now in the Hockey Hall of Fame in Toronto. 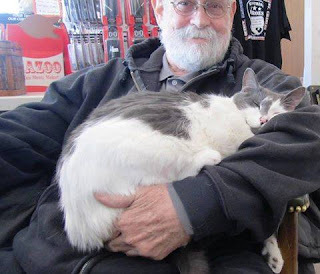 Lew liked to come in, plop down in the chair behind the counter, and make himself available to Fast Eddie, who wasted no time climbing into his lap for love. Eddie won't do that for many people, but there was something about Lew he just liked - maybe it was their shared love of hockey. Or cat nip. Lew was a good guitar player and was a member of a band in St. Louis. He was into vintage instruments and he bought a nice 12-string Aria guitar from us. He was quite proud of his graphite guitar, too. We saw him a month or so ago. He was too weak to get out of the car, so we went out to say hello. I think he knew his days were numbered due to lung issues, but he seemed accepting and content. He certainly packed more into life than most. Farewell, Lew. Fast Eddie, Sheryl and I will really miss you.